Sometimes you have to travel a long way to understand that health challenges are more universal than you think. Enter my 9,000 mile, 29-hour flight to Singapore recently, which took me very far away from home to discuss an issue that is really close to my heart, helping kidney patients and potential living donors learn about the option of living donation. I had never been to Asia and had never been on a flight that was more than 24 hours long. But, when the Singaporean Ministry of Health invites you to meet with more than seventy kidney, dialysis, and transplant leaders representing Singapore General Hospital, National University Hospital, National Kidney Foundation (NKF), Fresenius, Kidney Dialysis Foundation (KDF), DaVita and RenalTeam and the National Organ Transplant Unit (NOTU), you just say, “yes.” This was a chance to explore the transplant successes and challenges of a different culture and offer some suggestions and advice. What are the secrets of a 29-hour plane ride from Los Angeles to Seoul to Singapore and back? Layers of clothing, moisturizer, a toothbrush, contact solution, and a sleeping pill. Also, just so you know, on Singapore Air, they serve both dinner and supper, which was quite confusing, especially with all the time changes. FYI, supper is really a late night snack. After a week of intense meetings and exploration of Singapore’s very colorful city at the height of the Chinese New Year celebrations for the Year of the Chicken, a few things struck me. First, Singaporeans value working hard and doing their best work. While I had the privilege of meeting a new group of professionals who were primarily Chinese, Malay, and Indian, despite the distance and any cultural differences, they seemed like healthcare professionals I knew in the United States: passionate advocates for patients, committed to making the system of organ donation work better for everyone. Unfortunately, I also saw something else that was very familiar to me: rows and rows of kidney patients sleeping in dialysis chairs. According to the United States Renal Data System’s 2016 annual report, like the United States, Singapore is another global hot spot for kidney disease and kidney failure. 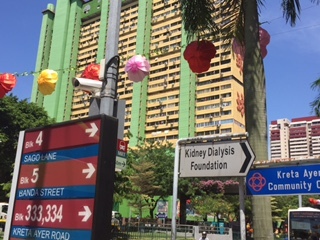 While Singapore has the 5th highest rate of kidney disease and failure worldwide, their transplantation rates are the 5th lowest internationally. Similarly, the United States has the 3rd highest rate of kidney disease and failure worldwide, and their transplantation rates are the 17th lowest internationally. What country is number one for successful transplantation? Norway. Every country faces unique challenges within their own healthcare systems and geography. This was my first experience learning about the challenges of providing healthcare on an island. Over 80% of patients with kidney failure receive dialysis in Singapore. With limited space, building more dialysis centers to accommodate people with kidney disease becomes impossible, geographically. We had many discussions about how the U.S. and Canada are working to increase the rates of dialysis occurring in patients’ homes, as well as transplant rates. As a Social Psychologist, I love learning about the similarities and differences of individuals and groups. What was fascinating to me was that cultural messages regularly used for transplant in the U.S. may not resonate at all with Singaporeans. In the United States, kidney recipients regularly thank their donors on their transplant birthday and share about how, post-transplant, they have been able to contribute more to their families and society. However, multiple people in Singapore told me that this concept of “paying it forward,” doesn’t apply. Similarly, in the United States, deceased and living donors are seen as “heroes.” In the United States, living donors can be seen walking alongside the Donate Life Rose Parade Float on January 1st, waving proudly to 30 million people on television, showing that they still remain healthy after donation. However, in Singapore, living donors are more private about their donation. After much brainstorming, many agreed that enhanced discussion of transplant and living donation would have to address how the family could benefit and ensure potential living donors that they could remain healthy enough to work and have minimal out-of-pocket expenses. While celebrating the Year of the Chicken, I learned that I am a “Pig,” known to be honest, straightforward, jovial, and enjoying the finest things in life. Expressing this fully, I enjoyed the many adventures and great conversations made possible by my generous hosts. I walked through celebrations in Chinatown, ate chicken and rice from open-air markets called hawker centers, and ate dinner at a renovated military base from when Singapore was first occupied by Japan. Drinking out of a large metal cup shaped like a pineapple, my new transplant friends shared with me their pride growing up in Singapore and how they see the international landscape of transplant. Every morning, with my box of crackers, I fed the orange, white, and yellow koi fish in the pond outside my hotel room. 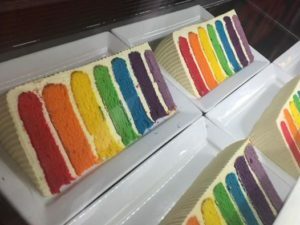 Speaking of the food available for me, I was impressed by how colorful it was—from rainbow cakes, to dumplings in hues of white, green and plum. 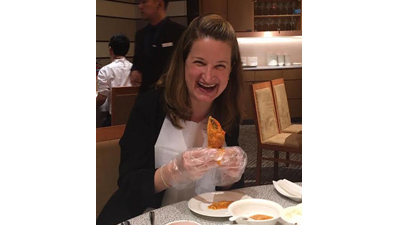 On my last night in Singapore, I tried the famous Singapore Chili Crab (pictured), a soupy dish which required me to wear gloves and a bib and to crack open crab legs! My hosts laughed at my awkwardness. My last meetings with the Singapore Ministry of Health and my hosts from Singapore General Hospital and National University Hospital focused on planning new initiatives to implement some of my recommendations. Returning home, now as an experienced international traveler, I chose as my first dinner something I had missed, a pepperoni pizza. However, contributing to transplant in Singapore in my small way was a highlight of my career. As I often say about working in this field — It is a real honor and a privilege. All the best to my new transplant friends in Singapore. Now I am ready for China and Japan!